Lamacchia Realty is proud to serve the city of Cambridge, MA. Our dedicated agents strive to meet the needs of every buyer and seller. They provide buyers and sellers with all of the tools and information they need for a successful buying/selling process. If you’re looking to buy a home in Cambridge, let Lamacchia help you! We are a full service real estate brokerage company with highly trained agents. Cambridge, MA is a city in Middlesex county in the Boston metropolitan area. It’s located directly north of the city, across the Charles river. Cambridge was named in honor of the University of Cambridge inthe United Kingdom, and is home to two of the world’s most prominent universities, Harvard and MIT. If you’re looking to sell your home in Cambridge, contact Lamacchia! We use many techniques such as television, photos, interactive floor plans, social media, reverse prospecting, and more, in order to guarantee that people will see your listing. We want potential buyers to really see how much your home has to offer. 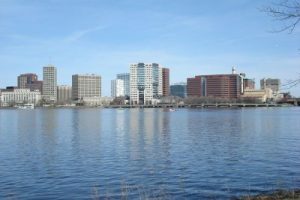 Located across the Charles River from Boston and with a population of approximately 113,000 people, there’s a home for everyone in Cambridge, MA! The median home price is $785,600. The median rent price is $3,001. Located in Cambridge is the Museum of Science, MIT Museum, Harvard Art Museums and Harvard Museum of Natural History. Harvard Square is a triangular plaza that homes history, learning, bookstores, coffee houses, fine dining and shopping! Cambridge is home to Harvard University, Hult International Business School, Lesley University, Longy School of Music of Bard College, and Massachusetts Institute of Technology. This makes it a great location for undergraduates and graduate students to live in. Cambridge is home to a large public school system. Cambridge Rindge and Latin enrolls just under 2,000 students and has 177 full time teachers. The student teacher ratio is 11 to 1 and the school preforms at the same average percentage in mathematics and reading as the state, 80% in mathematics and 90% in reading. For questions about the services provided by Lamacchia Realty in Cambridge, please call us at 339-645-9300 or fill out a contact form online!